Inside our stores, distribution centers and offices, our associates create community by working together to provide the best products and service to our customers. But The Home Depot community doesn’t stop at the edge of our parking lots. 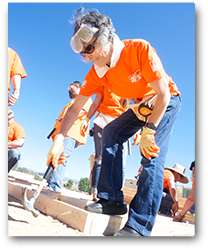 The dedication of our associates and The Home Depot Foundation extends our community beyond our boundaries and into the neighborhoods and cities we serve. Our name, The Home Depot, says it all. We’ve created a one-stop shop to help our customers build a home. We couldn’t have done it without the culture and feeling of home and family among the associates in our stores, distribution centers and corporate office, a feeling that’s evident in everyday life at The Home Depot. 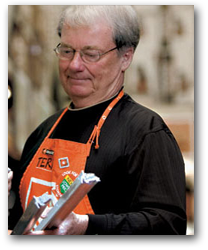 Before you apply for a position with us, take a few minutes to learn about life at The Home Depot. We think you’ll like what we have to offer. And we look forward to welcoming you to our family of associates. From the top down, the key to business at The Home Depot is customer service. In the stores you’ll have thousands of customers every day with all kinds of questions. You have to know the store layout, be familiar with products and services, and offer assistance on a variety of projects. 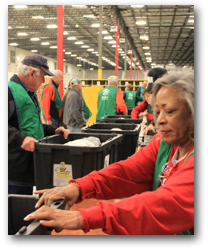 In our distribution centers your job would be to help the stores serve their customers. Our 70+ distribution facilities in North America ship products to more than 2,000 stores. The corporate office, known as the Store Support Center, exists to ensure stores have the resources they need to uphold our tradition of customer service. If you’re fired up by a rapid-paced environment and can smile through the busiest days, then you’ll love being a part of our customer service team. Speaking of teams, The Home Depot is looking for associates who are flexible, positive and eager to pitch in and help those around when needed. In other words, we’re looking for team players. In our stores teamwork is vital to success, from fulfilling everyday store responsibilities to the outside volunteer work our associates perform as part of Team Depot, people thrive at THD when they work together. In our distribution centers, teamwork is the only way to move products in and out efficiently and safely. Teams of corporate associates ensure support all aspects of The Home Depot, with the ultimate goal of ensuring our customers come first. If you’re ready to contribute to a team, whose goal is customer service, then you should thrive in our environment. Often our associates are drawn to careers at The Home Depot because they enjoy helping people with projects around their homes, providing excellent customer service or solving problems. Soon they discover that the culture of The Home Depot encourages them to do so much more. 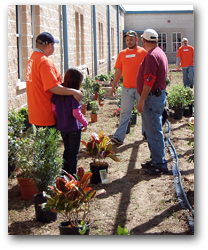 Volunteer opportunities are available through Team Depot for associates to help build their communities. Training, to grow in life and in a career, is encouraged. 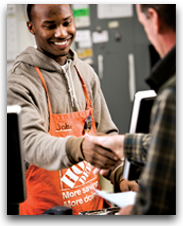 If you’re looking for more than a job, The Home Depot may be able to offer you a career and a way of life. *Specific benefits eligibility may depend on employment status, physical location, and years of service. For more details, visit livetheorangelife.com or view our infographic. We are proud to provide career opportunities across the nation for current and former members of America’s military and their spouses. Giving back is a core value at The Home Depot and is a passion for our associates. With more than 30 years of history contributing to the communities where our associates live and work, The Home Depot strives to meet critical needs in the areas we serve. Since the first The Home Depot store opened in 1979, giving back has been one of our core values and a passion for our associates. 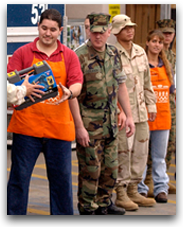 Today, we, along with The Home Depot Foundation, focus our philanthropic efforts on improving the homes and lives of U.S. military veterans and their families and aiding communities affected by natural disasters. Through Team Depot, our associate-led volunteer force, thousands of associates dedicate their time and talents to these efforts in the communities where they live and work. Team Depot, The Home Depot’s associate-led volunteer force, uses the time and talents of associates to meet veterans’ housing needs through hands-on service. 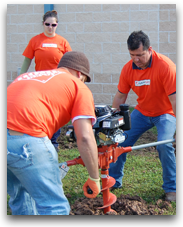 Team Depot Captains in each store coordinate volunteer efforts through non-profit organizations to benefit veterans in their local communities. Through Team Depot, thousands of Home Depot associates positively impact lives by performing basic repairs and modifications to homes and facilities serving veterans with critical housing needs. 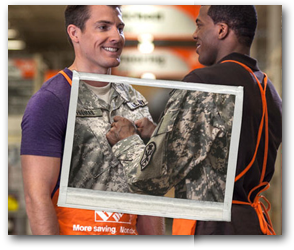 Since launching its commitment to veterans in 2011, The Home Depot Foundation has invested more than $110 million to provide safe housing for veterans, and along with the help of Team Depot volunteers, has transformed more than 25,000 homes for veterans. When natural disaster strikes, The Home Depot is among the first to ensure its customers have the supplies, resources and support they need to rebuild their homes and communities. To respond effectively, The Home Depot Foundation partners with nonprofit organizations like Team Rubicon, an organization that rallies military veterans to help and empower those impacted by disasters. In addition to supporting relief efforts for specifics events, the Foundation contributes $1,000,000 to the American Red Cross Annual Disaster Giving Program to ensure it is prepared to respond immediately after a disaster strikes. In the same way that The Home Depot’s products help people build homes and projects, the eight core values we uphold help us build a strong business and culture. Our nearly 300,000 associates share The Home Depot’s “orange-blooded” culture, which encourages inclusion, passion and respect both within the company and extending to all parts of our lives. Customers are The Home Depot’s business. We must go the extra mile to give our customers exceptional value, knowledgeable advice about merchandise and to help them use those products to their maximum benefit. Our associates are key to our success. We strive to create an environment where all associates feel they are respected, their contributions are valued and they have equal access to growth and development opportunities. Trust, honesty and integrity are the foundations of strong relationships. We demonstrate these principles when we listen and respond to the needs of our customers, associates, communities and vendors. A work environment of mutual respect and inclusion is essential to the success of The Home Depot and its associates. Diversity is valued as a way to better serve our broad array of customers. Our associates are encouraged to adopt and adapt good ideas from others, and initiate creative and innovative ways of serving our customers and improving the business. We strive to understand the impact of our decisions. We accept responsibility for our actions. We do not tolerate dishonest or unethical behavior. We do the right thing. An important part of The Home Depot is giving of our time, talent, energy and resources to our community and society. 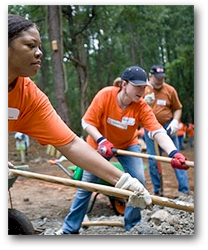 Corporate community involvement is coordinated through The Home Depot Foundation. Team Depot, The Home Depot’s associate-led volunteer force, uses the time and talents of associates to meet community needs through hands-on service. The investors who provide the capital to allow our company to exist need and expect a return on their investment. By upholding our core values, we are using their investment wisely, which ensures that we operate a profitable company.